The look and feel of George Stevens’ Giant beckons instant comparisons to Gone With the Wind (1939). Like the latter, Giant was an epic tale of life in the deep south, based off a famous book by a female author, this time Edna Ferber instead of Margaret Mitchell. 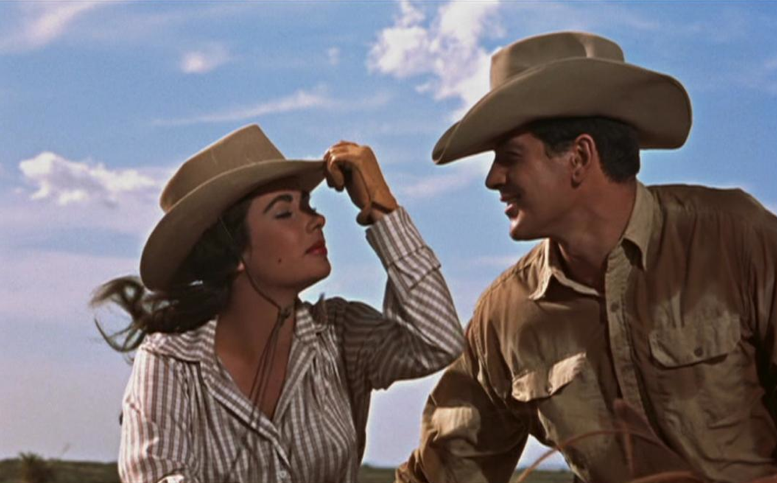 Its Texas homestead Reata is Tara reimagined, with Rock Hudson a sturdy Rhett Butler, Elizabeth Taylor a less bratty Scarlett, and the films’ scope just as big. Stevens admitted he hardly noticed GWTW‘s four-hour length, saying, “I was caught up in it and could have watched even more.” (A) Thankfully, he spared audiences the “more” on Giant, but at some three hours and change, the film lives up to its title. It wasn’t nearly as successful as GWTW — how could it be? But it still was Warner Bros. most successful film up to that point, earning 10 Oscar nominations and correcting GWTW‘s most glaring flaw — its racist undertones. Stevens did a complete 180 and gave his film a message of racial harmony. Granted, GWTW was made in a different time, and Giant had 17 more years of social evolution under its belt. But it was still a radical message for 1956, as America had just launched into the Civil Rights Movement (1954-1968) and was at a tipping point when it came to race. Two years earlier, Brown vs. The Board of Education had called for the desegregation of schools across the country. And just one year prior, Americans had witnessed the brutal murder of Emmett Till. That Giant should carry a message of racial justice should not be a surprise. It reflected the audience who came to see it. One can imagine theaters divided down the aisle — some arguing for radical social changes, others wanting to preserve tradition. Hopefully, as the two joined in the aisles to exit the theaters, their better angels converged around the film’s message of tolerance. For Giant is another word for “big,” as in “being the bigger man,” as in being big enough to respect others different from you — a message ripe for any era. Growing into a “giant” is the journey of Jordan “Bick” Benedict, Jr. (Hudson), the owner of Reata, a 600,000-acre Texas cattle ranch passed down for generations. Bick is all about the southern tradition, and that happens to include white males running the show. When he goes to visit a Maryland farm to buy the prized horse Wild Winds, he comes back with a wife, socialite Leslie (Taylor). While she converts to the positives of southern lifestyle (“Don’t you worry about me. I’m a tough Texian now”), she refuses to give in to the negatives. She mocks sexism with lines like, “Set up my spinning wheel, girls,” and fights racism by aiding the impoverished Mexican-Americans of the region. Bick, all the while, struggles to understand. During this journey of man and wife, right and wrong, past and present, the Benedicts struggle against a cocky young handyman, Jett Rink (James Dean, in his last role), who lusts for both Leslie and Benedict wealth. While fending off his advances, Leslie must also deal with Bick’s jealous sister Luz (Mercedes McCambridge), who shocks Leslie with her racism. When Luz is bucked off Wild Winds and killed, her will leaves Jett a plot of land within the Benedict ranch. Jett refuses to sell it back to Bick, fences off the area and names it Little Reata. Little do Bick and Leslie know that it’s an oil-rich area, and Jett hits it big with a gusher of black gold. Before long, Jett has his own oil drilling company and becomes super wealthy. After initial reluctance, Bick allows Jett to drill on his property, making the Benedicts even more wealthy as they raise their three children, Jordan “Jordy” Benedict III (Dennis Hopper), Judy (Fran Bennett) and Luz Jr. (Carroll Baker). With the coming of children comes the dispute over how they should be raised. Bick wants his son to follow in the family tradition and take over the ranch, but Jordy wants to become a doctor. When he marries a Mexican American named Juana (Elsa Cardenas), Bick is even more disheartened. All the while, Leslie pleads Bick for tolerance, and Jett plots to finally embarass the Benedicts. After dating Luz Jr., just to drive Bick crazy, Jett invites them all to a giant gala in his own honor, only to intentionally turn Juana away. Jordy tries to fight him, and Bick backs up his son, taking Jett into the kitchen, but ultimately deciding, “You’re not even worth hitting.” The Benedicts leave, Jett embarasses himself by wallowing in drunken loneliness, and Bick must finally take a stand against bigotry in a roadside diner. Is he man enough to do it? Can he become the giant his wife wants him to be? Is morality incompatible with protecting a way of life? He’d judge ’em by the tone of their skin. Till the grace of God got in the way. Rose up a brand new man, left the old one right there. Here’s to the strong who come to understand this. Giant is a call to all people, of all regions, of all demographics, anyone struggling to seperate tradition from human rights, to step up and become a giant. It shows the possibility of people having the best of both worlds: a new open-mindedness to go along with romanticized tradition. In many ways, the success of the screenplay hinged on whether or not it could capture America, as Bick’s journey is also the American journey, a constant balance of status quo and evolving moral standards in both industry and domestic life. For this, Giant is considered the final chapter in Stevens’ “American Trilogy,” joining A Place in the Sun (1951) and Shane (1953). From the former, Stevens brought back Liz Taylor, a star on the cusp of greatness. Just one year after Giant, she would begin a streak of four Oscar nominations in a row: Raintree Country (1957), Cat on a Hot Tin Roof (1958), Suddenly, Last Summer (1959) and winning for Butterfield 8 (1960). She would win again for Who’s Afraid of Virginia Woolf? (1966), exactly 10 years after Giant, so you might say her Leslie comes just as she was coming into her own. And what a fine leading lady she makes, both with her beauty (she has purple eyes!) and her air of independence, holding her own against men, and against the conservative matriarch, McCambridge, whose authenticity earned her an Oscar nomination. As for Hudson, it may very well be his career performance. He became well known across the screen from Doris Day in films like Pillow Talk (1959) and under Douglas Sirk in All That Heaven Allows (1955) and Written on the Wind (1956). But Giant remains the only film that ever earned Hudson an Oscar nomination. It’s his performance that’s responsible for carrying the film’s entire theme, and his role as a man finding tolerance must have been closer to his heart than anyone even knew at the time. Nearly 30 years later, when Hudson died of AIDS, we learned of his long repressed homosexuality. As Morgan Fairchild said, “Rock Hudson’s death gave AIDS a face,” (C) and looking back Giant, one can see its message apply to a new kind of tolerance for the 21st century. That same message could very well apply to the iconic James Dean, long rumored for sexual ambiguity. But more than anything, his rags-to-riches Jett Rink is a commentary on class, on the dangers of greed and jealousy and, as James Hay points out, a representation of real-life oil tycoon Glenn McCarthy. (B) It was only Dean’s third role, after his Oscar-nominated debut in East of Eden (1955) and his legendary role in Rebel Without a Cause (1955). Sadly, it was also his last, as Dean was killed in a car accident before the last day of shooting. As a result, his character’s drunken collapse at the banquet room has since been dubbed “The Last Supper,” an eerie foreshadowing of events to come. How fitting that Dean’s final character be described as a “legend in his own time,” as that’s exactly what he was. Find another 24-year-old who could play such a character through the aging process of two generations. The performance earned him the first ever posthumous nomination. After Dean’s death, while the country was in mourning, Oscar-nominee Nick Adams (Twilight of Honor) had to be called in to provide Jett’s voice for a few lines. The film spent more than a year in the editing room, during which time Stevens allowed his son, George Stevens Jr., to assist him. The young Stevens remembers it as one of the most laborious, yet eye-opening experiences he ever had. “I joined my father for the final stages of editing Giant, which had already taken a year, and being in my early twenties and restless, I became impatient with his meticulousness,” Stevens Jr. said. “We’d had three previews with enthusiastic audience response, but he was still switching one close-up for another to refine performances, trimming frames off shots and sliding soundtracks to sharpen scenes. I need not go into all the panoramic Texas views, captured gorgeously in widescreen Warnercolor, except to say that they prove Stevens’ eye for the naturally majestic and his appreciation for the treasure that is the American landscape. I’d rather focus on his more subtle directorial contributions. For starters, note his use of the soundtrack, not just Dimitri Tiomkin’s epic score, but the choice of the “Yellow Rose of Texas” playing on the diner jukebox as Bick contronts both a bigot and his own values. However small a choice, it’s one that reinforces the film’s atmosphere while advancing both theme and character. One can just feel the tension in that restaurant, and it’s because Stevens has so set the mood. “It’s incredibly powerful and I think particularly because the film avoids turning Rock Hudson into a savior,” noted Chicano scholar Chan Noriega says. “His redemption isn’t because he confronts and beats up Sarge, the restaurant owner, but because he loses and has to grapple with his own racism.” Poet Tino Villanueva wroe an entire book devoted to that one scene, aptly titled Scene from the Movie Giant. (E) It has to be one of the most socially influential scenes ever done, right up there with Sidney Poitier slapping a white man in In the Heat of the Night (1967). Stevens also uses visual symbolism to relay his themes. Note the way he gets his point across about new wealth vs. old weath by simply showing Dean’s hand, covered in oil, lean up against the clean white pillar of Bick’s estate. When it comes to the struggle between past and present, note how he intercuts between a flying airplane and galloping horses. This old way versus the new way blends into his commentary on racism. Note the Thanksgiving scene where Leslie dresses her kids with paper Indian head dresses, and Stevens places them behind the “jailbars” of a railing. Note also how he uses staples of southern clothing as a metaphor for the old way of thinking. In scenes of most racial tension, you’ll see cowboys proudly wearing their hats, just as you’ll see a pile of hats sitting beneath a row of Mexican and American flags. And when McCambridge’s dead body is laid next to western portrait, and her cowboy boots stick out from under her death blanket, we know that her old way is also soon to die. Along similar lines, note the way Stevens uses lighting to sway audience perception of his characters (as he did in A Place in the Sun). There is a particular scene where Bick and Leslie are arguing over whether a Latino should receive a white doctor. As Bick argues against it, Stevens removes almost all light from the scene. But when Leslie argues for racial equality, Stevens gives her plenty of light. Visually, perhaps even subconsciously, he’s telling us which side of the argument to agree with. There’s no way you can come away from Giant without respect for Stevens as a director, unless you want to argue that he forsakes tone for sheer scope, with an overblown result, which is debatable. Still, I prefer to view Stevens as a very personal filmmaker, at times overly ambitious, but nonetheless approaching it right. Joe Mankiewicz, who produced Stevens’ Woman of the Year (1942), put it best: “After the actors and the technicians were gone, there was nothing left but George and his film.” (A) His dedication to the editing room is proof of that. And my book, Stevens’ Oscar for Best Director (his second and last) is well deserved. Other directors agree. In the Sight & Sound Directors’ Poll, Milos Forman (One Flew Over the Cukoo’s Nest, Amadeus) ranked Giant in his own personal Top 10, ahead of Coppola’s The Godfather (1972), De Sica’s Miracle in Milan (1951) and Scorsese’s Raging Bull (1980). Overall, though, Giant has been slipping in the polls. Like A Place in the Sun, Giant made the AFI’s original Top 100 Films list (#82) but fell off in the 10th Anniversary Edition. It also doesn’t seem to translate with modern audiences, scoring just a 7.7 on IMDB. Perhaps this is because feel have the patience to sit through it, or because some of the novelty of Dean has worn off. Either way, I remain a fan, on the side of the 97% on rottentomatoes.com. For me, the film falls into that rare category of “classics” with a message so important that it’s earned airings on public television and remains just as relevant to today’s immigration debate. Is it on par with Gone With the Wind? No. The film is far less spectacular and far less embedded into our culture — except for Dean’s fleeting images, so unforgetable that even a character in Jarhead (2005), when covered in oil, screams, “I’m rich! I’m rich! It’s like James Dean in Giant!” Like it or hate it, it’s a movie everyone should see, for no other reason than to catch a glimpse of Taylor, Hudson and Dean. Check it out one lazy Saturday when you have time to kick back and take it in. Stevens preferred it that way. As Steven Spielberg said, “We admire Stevens today because he never rushed his images, casting long spells on us, only asking us to be patient with him—and when we were, he would reward us with one indelible moment after the other.” (A) And so there’s James Dean in silhoutte, scaling that oil rig for all time.